Viipurin Golf Club was founded already in 1938 and it has long and famous traditions. Viipurin Golf Club has in Lappeenranta two golf courses. Etelä-Saimaa golf course – where quality and beauty of the course meet pleasure to play! 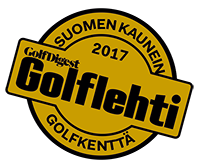 In 2017 Golf course Etelä-Saimaa golf was ranked the best golf course in Finland and the most beautiful golf course over the whole country (according to the Suomen Golflehti, published by Finnish Golf Union). The 18-hole Etelä-Saimaa Golf Course is located approximately 15 minutes from the city center of Lappeenranta on the island of Tuosa and is characterized by its splendid Lake Saimaa views. In Etelä-Saimaa Golf Course, there are excellent practice range, target green with bunker, short game practice facilities, putting practice greens, clubhouse with high-level restaurant, dressing rooms with lockers and sauna, parking areas and pro shop offering the latest fashion in golf apparel. Fluently English speaking professional golf instructor provides golf lessons and green card courses. Clubhouse is open daily from 08.00 to 22.00. In Kahilanniemi there is 9-hole golf course, which is situated only approximately 2 km from city center of Lappeenranta. This 9-hole course stretches along Lake Saimaa, and is one of the best park courses in Finland. Kahilanniemi Golf Course has driving range with covered bays and grass tees, short-game facilities for putting, chipping, pitching and bunker shots, parking area, cafeteria and pro-shop. In Kahilanniemi Golf Course fluently English speaking professional golf instructor also provides golf lessons and green card courses. Tee times can be booked up to 5 days in advance. Caddie Master is open daily from 08.00 to 20.00. Greenfee in 2018 in Etelä-Saimaa Golf Course is 55€/30€ for juniors/students under 23 year, and in Kahilanniemi Golf Course – 30 €/15 €. During the high summer season 16th June – 5th of August, 2018 the greenfee in Etelä-Saimaa Golf Course is 65€/35€. Starting times are at 10-minutes intervals. Viipurin Golf Club warmly welcomes all visiting golfers with green card certificate and Hcp max 45. Please, be prepared to show your handicap certificate and membership card to caddie master when paying green fee. The maximum team handicap sum cannot exceed 110. Membership fee for adults is 100 Euros, and for juniors/students under 23 year – 50 Euros. Hcp for members of Viipurin Golf Club is 54. Why not joining the rich in traditions Viipurin Golf Club! tel: + 358 40 5401200. Keep your round of golf moving by being prepared to hit your shot when it is your turn. You probably do not like waiting on other groups – do not make other groups wait on you. Playing time is max. 4,5 hours. The Marshall is entitled to force slow groups to move up. In the pro shop, you can buy a stroke saver with accurate and clear hole-by-whole information and tips, which helps you to orientate in fairways. You can make a break for 8 minutes after first nine fairways if your round is moving with good speed. Golf cars for two persons can be rented from Caddie Master with certain restrictions, such as weather conditions and large amount of golfers at the same time in the course. Keep carts away from greens and hazards. The wheels on carts can damage these sensitive areas. Repair your divots in the fairway and your ball marks on the green. Always rake sand bunkers after hitting to erase your footprints and damage to the area where your ball was. On driving ranges, golfers are allowed to use golf balls specially marked and meant for practicing in the practicing area. You can get range balls from ball machine by using chip cards (sold by Caddie Master). The driving range is open daily from 08.00 to 20.00. Golfers are allowed to hit range balls only to the certain direction; it is not allowed to take range balls away from the range area. The driving ranges will be closed for picking up range balls from the practicing area. On practicing greens, golfers use their own balls. Please, keep the practicing safe also on practicing greens! Trousers made of denim material; tracksuits and tennis wear are not allowed. Men’s shorts must be at least Bermuda length. Men’s socks must be at least of ankle length. Men’s shirt must have collars and long or short sleeves. Ladies t-shirts without collar must have sleeves. Ladies t-shirts with collar may be sleeveless. Golf etiquette is designed to make the game of golf safer and more enjoyable for golfers and to minimize possible damage to golf equipment and courses. Golfers are customarily expected to observe international golf rules and practices in both golf courses of Viipurin Golf Club. You are very warmly welcome to play golf in Lappeenranta, see you in Viipurin Golf Club!